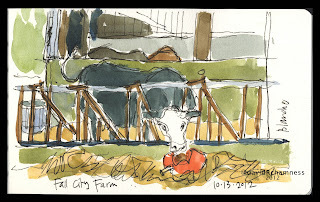 For the World Wide Sketch Crawl I joined the smaller group out at Fall City Farm. The rainy weather and high humidity kept us all under cover most of the time. 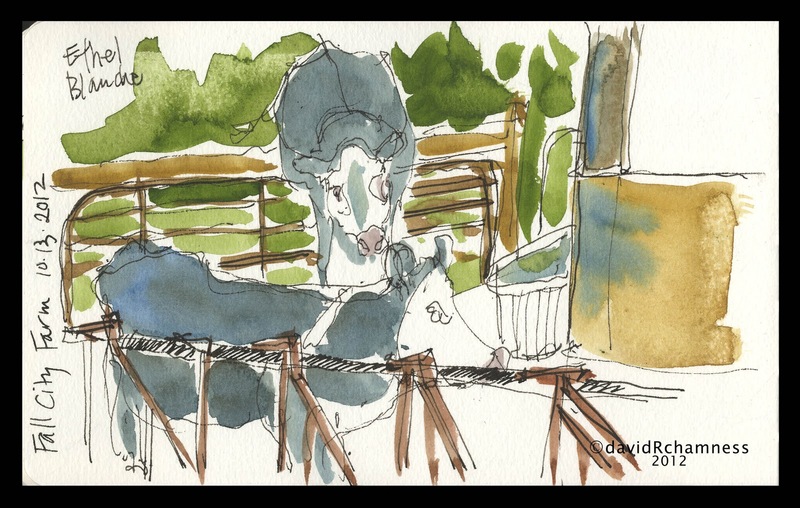 I drifted into the barn to do a quick sketch of the cows, but staid because the showers kept coming. 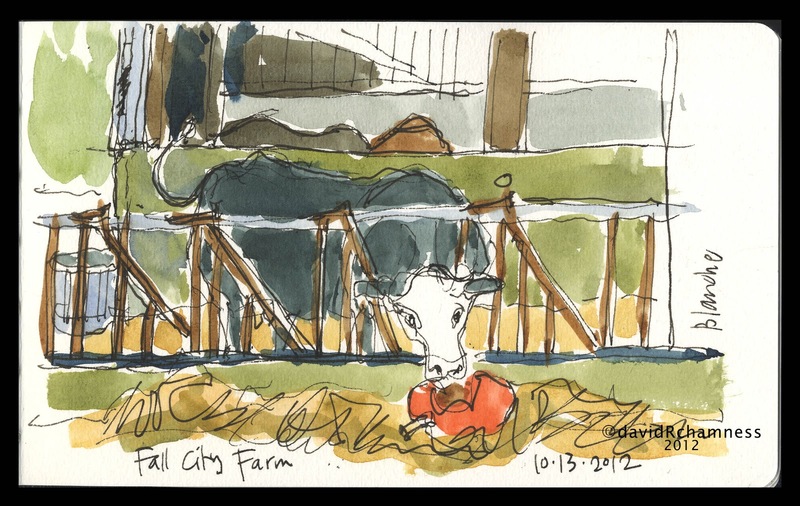 The cows were constantly in motion which was a challenge and so I appreciate Gabi's work in the Times where he quickly captures his interviews and makes them look right. The cow sketches are combination of stances which tended to distort their bodies. More practice and fewer strokes! 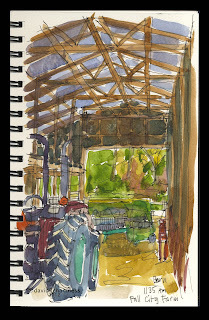 The whole time I was standing and balancing sketchbook, water, watercolors and blotting paper. Another good practice moment, but tiring. 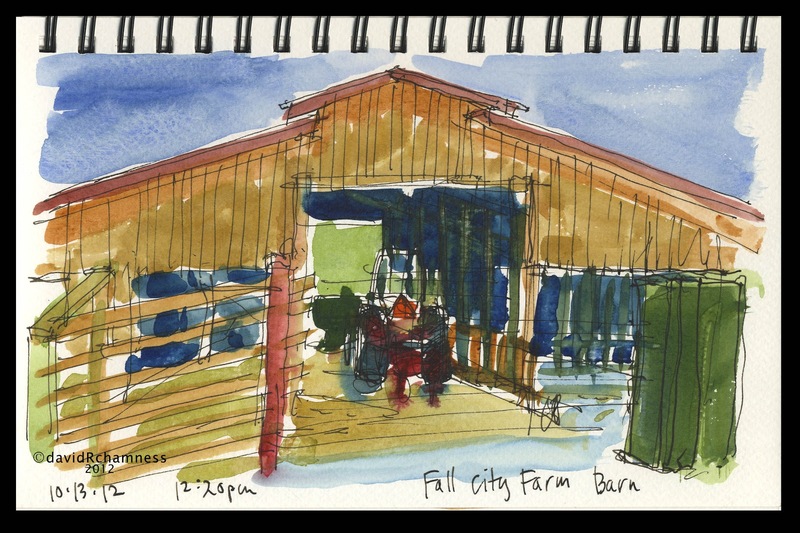 The inside of the barn away from the cows was a lot of farm machinery and barn structure. My eyes kept adjusting between the bright colors outside and the dim areas inside. A real challenge to capture the difference without turning the whole thing muddy. The humidity kept all the colors wet for most of the time sketching; try not to turn the image into a big mess. Finally got outside for a quick exterior of the barn. I had a lot of very wet paint on the paper with this sketch. 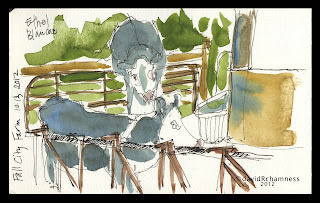 Outside sketching in the Northwest is great fun for experimenting and working fast and loose. 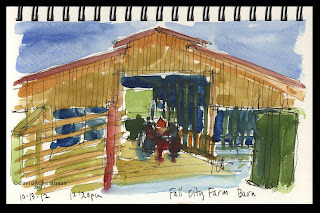 Again a fun afternoon with the group and a lot of great sketches by all.